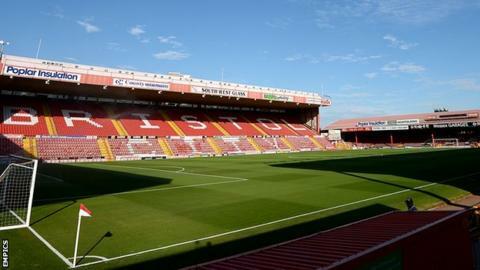 Bristol City have defended the decision to move their home game against Notts County with only a week's notice. The match was due to be the only League One game played on Saturday, 19 April. With the Football League's permission, it has now been moved to Friday, 18 April to coincide with other fixtures. A statement said: "It left Bristol City and Notts County as the only clubs playing Saturday-Monday over Easter, putting them at a huge disadvantage against their rivals." Notts County are second-from-bottom in League One, three points from safety, while Bristol City are currently 15th in the table, just four points above Crewe Alexandra in the relegation places. The Robins, who appealed to the Football League on Thursday, 10 April to change the date of the match at short notice, are offering to refund tickets purchased for the game. "The club fully appreciates this puts pressure on supporters who may have made plans for the Easter weekend, and we apologise for any inconvenience caused," read the statement on the club website. "At the same time, to give the team the best chance of preparing properly for both Easter games and securing its League One status, it was decided to press ahead with the fixture change. "